Today we got the results of the face-to-face component of the 2017 British Election Study. For those unfamiliar with the reasons why this is such a big deal, this is a random probability survey, with repeated callbacks – its researchers selects addresses at random and try as many times as necessary (20, in one case) to secure the 45-minute interview.  As a result, it’s the closest thing psephologists get to the holy grail of a representative sample, which in turn allows us to analyse the election without a lot of the caveats we have to use with conventional opinion polls. That said, a few caveats remain. Even a gold standard survey has margins of error, about ±2.2 points on the full sample and higher on subsamples – even more so when we’re comparing one election against another. Also, the reported vote still doesn’t quite match the election result, so the following analysis uses weighting to the 2017 vote shares and turnout. Good luck trying to find a precise definition of “youth”, but it’s probably fair to say that most people talking about a “youth surge” in turnout in 2017 were referring to under 25s. And they were wrong… The BES found no statistically significant increase in turnout between 2015 and 2017. The @BESResearch 2017 is out ? 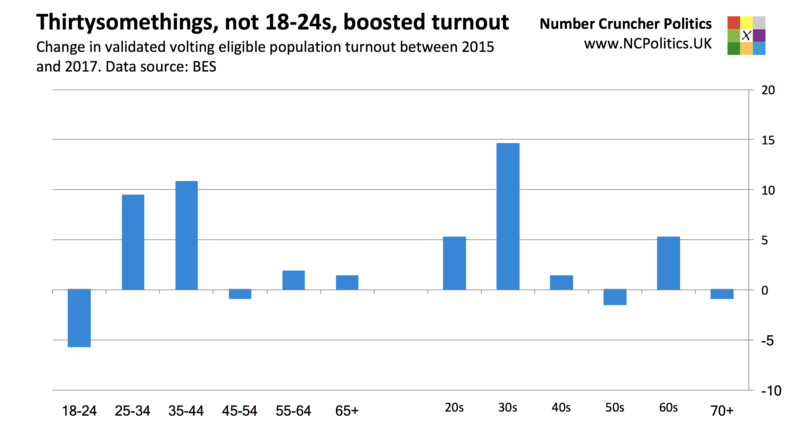 As a side note: the pattern of turnout changes compared with the EU referendum shows the same surge among 25-44s. (We can’t make the same comparison as GE to GE because there was no face-to-face BES with vote validation in 2016, but it looks very similar). 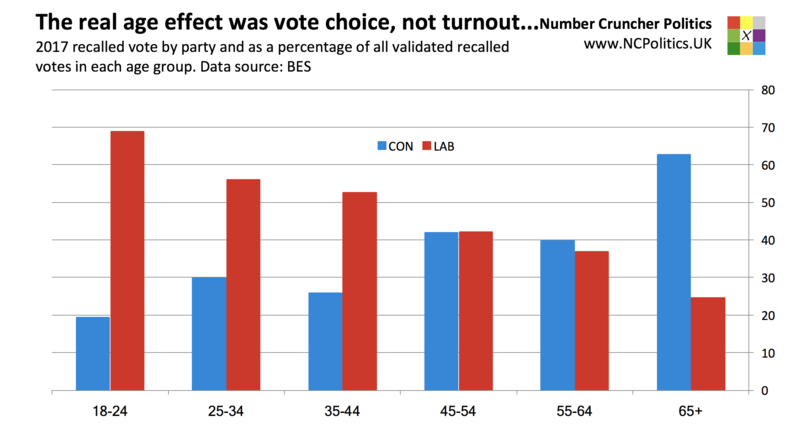 Where the 18-24s were more dramatic than voters a bit older than them was in vote choice. 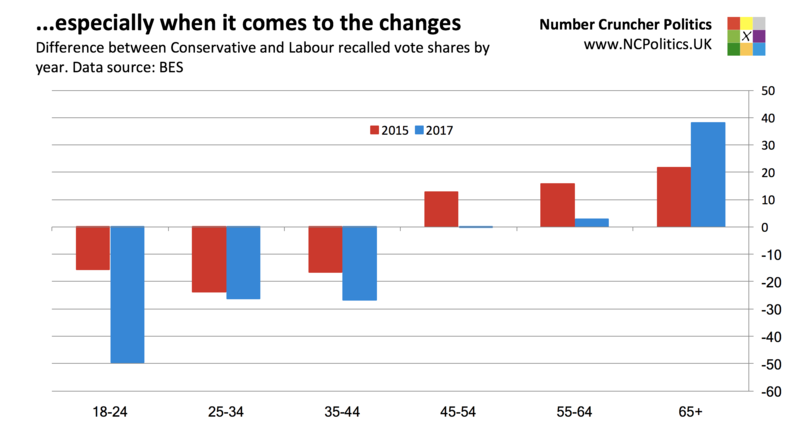 The divergence by age really was as stark as polls suggested, with under-25s backing Labour by almost 50 points, and over-65s backing the Conservatives by almost 40 points.